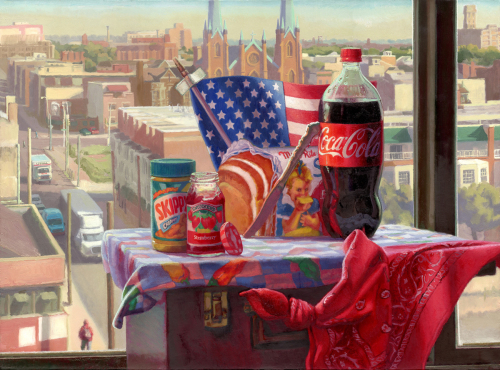 The popular American consumer products in the painting "The Golden Age of Capitalism" are placed at eye level on a worker's box top in front of a window overlooking Philadelphia's old industrial district. The sixth floor vantage point is intended to give the viewer a feeling of power. A fat, two liter plastic bottle of Coca Cola poses next to an American flag, which in turn poses next to a church. The flag and the church reference freedom of religion while the flag and flagon of Coke reference icons of American culture, the sacred and the profane, so to speak. A butter knife connects the flag and flagon to Little Debbie, an American icon of consumer products, eating her way thru a bag of white bread, actually a hand painted detail of American painter Tom Wesselman's "Still Life # 35, 1963" Peanut butter and jelly jars stand at attention in the foreground as signifiers of contemporary American diet. Finally, the still life objects are arranged in an effort to lead the eye around a circular negative space in the center of the composition. In painting “The Golden Age of Capitalism That We Live In” I considered the cultural landscape of the United States from an historical and personal perspective. I researched and analyzed recognized artworks that interpret aspects of the American landscape in creative ways. I rediscovered paintings of the American lifestyle of the 1960’s, a time I can relate to. The biggest challenge I faced was the difference between the two major elements in my composition, the landscape outside brilliantly lit, and the still life indoors against the window, artificially lit with candlelight.